We knew how desperate Google was to get some of that live social status sharing action when it signed up Twitter to give it some real time search relevancy. But we didn’t know how it would boost Twitter, ’til now. It’s a lot. 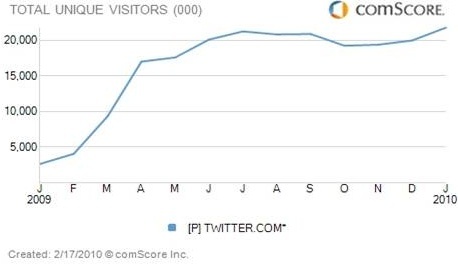 According to some data-crawling by the folks at VentureBeat, the big switch-on of Twitter’s real-time data feed into Google’s search engine reversed the slight downwards trend in visitors to Twitter.com. What’s more, the fact that Tweets appear in a real-time updating window when certain newsworthy search terms are used has resulted in a direct 9% traffic boost to Twitter’s site. Clearly Googlers value the real-time stream and are clicking on specific Tweets out of interest–excellent news for both Twitter, and Google of course. The nearly 22 million unique Twitter visitors in January 2010 was a record-setter for the social sharing company, topping the previous peak in July 2009. And even in the month when Google launched the service (December) there was a measurable traffic bump. But this gets even more complex. Twitter.com as a Web site destination isn’t the be-all and end-all for Twitter’s users: Desktop clients for Macs and PCs are a huge phenomenon, and mean that actually many more millions of people are using Twitter than those visiting its Web portal would suggest. And with booming smartphone sales, and the convenience and little time-wasting benefits of Twittering from a smarpthone app, Twitter is a perfect social net for the mobile user too–users who also wouldn’t show up in Twitter’s home-page visits. Clearly many tens of millions of people are using Twitter, and that’s probably been a key driver behind Google’s decision to try its own hand at social networking, with the controversial Buzz. Buzz, of course, also lets you drive its status updates with a direct wire-in from Twitter. Which is how many users I’ve come across so far are using Buzz–thanks to the convenience of Twitter, and the hassle of otherwise having to maintain attention across several different social nets. In fact, many people are driving their Facebook status updates this way too. And this causes me to ponder as Twitter’s strength grows, thanks to increasing international participation, and this new kicker from Google’s real time feed, will we actually see Twitter move into the dominant role as the preferred front-end to everyone’s social networking activity? Read more about Twitter, one of our Most Innovative Companies for 2010, here. And follow Kit Eaton‘s, and Fast Company‘s Twitter feed for more news.